In a campaign to help reunite parents with children who have been placed in foster care, Philadelphia's Department of Human Services and Office of Homeless Services have launched a new program called Rapid Re-Housing for Reunification. The program helps parents get into affordable housing faster, in hopes that it will help reunite them with their children. Read more here. In Vancouver, volunteers take count of the city's homeless population, and gain more information about rough sleepers' identities, lives and experiences with incentives like tobacco and candy. Read more here. Last Thursday the Affordable Housing Institute hosted a Webinar for their new publication Cuba Facing Forward: Balancing Development and Identity in the Twenty First Century. We here at IHC Global were excited for the opportunity to sponsor this very informative webinar with experts in the fields of architecture, housing and urban development, and Cuba-U.S. relations. You can watch a recording of the webinar here , and don't forget to add IHC Global to your Amazon Smile when you pick up the book here. In a moment of bipartisan cooperation, house and senate committees amended and approved the BUILD Act. This motion may lead to further public-private partnerships in housing and Urban development, as well as further potential involvement with USAID, read more here. A few weeks ago, the arrival of Ebola in a city for the first time ever sent a wave of fresh concern throughout the medical community over effectively containing the crisis, especially in an urban area. But the city that it landed in, Mbandaka in the Democratic Republic of the Congo, has emerged relatively unscathed. A massive relief effort played a significant role in containing the outbreak, but what's needed moving forward is better infrastructure for continued resilience. Read more here. Epidemics and Pandemics, however manageable they may be with modern medicine, are unavoidable. And one of the most pressing threats of the day is the rise of the superbug, or diseases that are resistant to antibiotics. With dense population centers that could turn into disease incubators at the drop of the hat cities need to start preparing. Read more here. The city of Songdo, Korea, boasts smart city conveniences that fit into all the wildest dreams of a futurist, from trash tubes that lead to underground waste facilities to heating your home before you even get there. But is the price of these luxuries a social life and sense of community? Read more here. For the ninth World Urban Forum, IHC Global President and CEO Judith Hermanson wrote an article about IHC Global's "Smart City. Just City." campaign for the Journal of Public Space. Read the article here. On Wednesday June 27, IHC Global attended the Innovation for Inclusion Summit and the Urban Institute. Many distinguished panelists representing the private sector, local and state government, and the cutting edge of data analytics and smart city tech came together to discuss ways in which cooperation and dialogue between communities and sectors can make urban development more equitable and inclusive for all, read more here. When the Open Government Partnership was founded in 2011 by nine civil society members and eight national government leaders- including former President Obama- to create more responsive, transparent and accountable governments around the world, the unique collaboration between governments and civil society organizations worked solely at the national level. But the world is rapidly becoming an urban landscape, and encouraging accountability and transparency in cities that are growing in global influence by the day is more important than ever. In 2016 OGP took this indisputable fact and created the OGP subnational pilot program, adding city and regional governments and their civil society partners to the 2000 civil society organizations and 76 countries. IHC Global sat down with Brittany Lane, the Program Manager for the subnational pilot program, to discuss how the program works, and where their cities' work intersects with urban WASH, gender equality, housing and more. For more on IHC Global's policy priorities, click here . Keep an eye out for a new blog in next week's newsletter. Scientists say that focusing on cutting urban emissions could cut China's total emissions by 30%. The mayor of Ghent has written an open letter to European governments on the state of the migrant crisis. Just for fun: see if you can recognize these cities from space. 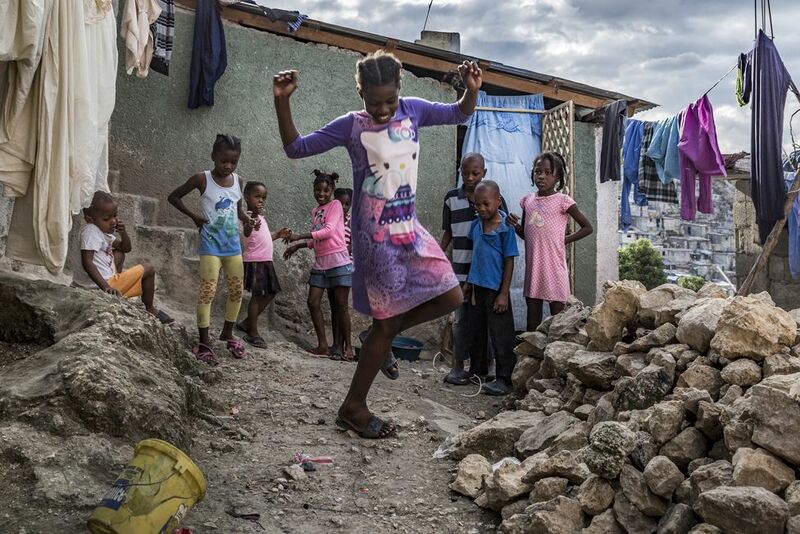 Children play in the Haitian slum city of Jalousi.